I farkin love it. Horny. Good to see they have bucked the current matte paint trend. Shiny! The new SIC Yamaha MotoGP team has confirmed it will carry title sponsorship from Petronas, while officially unveiling 2019 riders Franco Morbidelli and Fabio Quartararo and its Moto2 and Moto3 line-ups. SIC will replace the Angel Nieto Ducati team on the MotoGP grid next year, and will take over from Tech3 as Yamaha's satellite team. 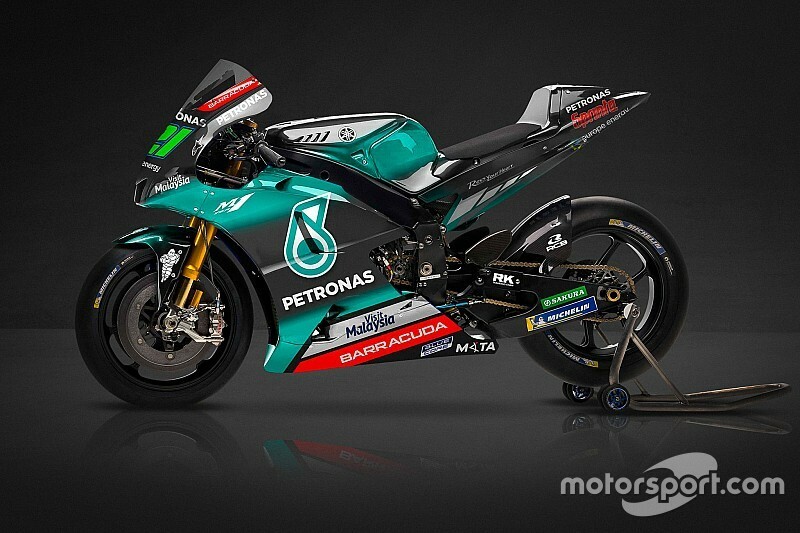 In a press conference during MotoGP's British Grand Prix, it was confirmed that the Sepang-owned team will field Morbidelli and Quartararo next year and be sponsored Malaysian oil company Petronas. Valentino Rossi protege and reigning Moto2 champion Morbidelli moves across from the Marc VDS Honda team where he is spending his MotoGP rookie season. Quartararo graduates from Moto2 having been picked over current Nieto rider Alvaro Bautista, who is heading for World Superbikes with Ducati, and after Dani Pedrosa chose to retire rather than join SIC. Azman Yahya, chairman of the Sepang International Circuit, said: "The formation of this team completes our motorsport development programme for Sepang. "We started four years ago with Moto3, moving to Moto2 this year, and within a four-year period we are present in Asian Talent Cup, Spanish CEV, Moto3, Moto2 and MotoGP, it is an unprecedented position for any team in the world. "This dream of having a MotoGP team is shared not just by us but by millions of Malaysians, the fans. "We saw as a track owner how the support of Malaysian MotoGP improved over the last few years since we had riders in the lower categories and we expect this year we will surpass last year's crowd record, 150.000 over the weekend. "This is very important for us as the track owner." SIC entered Moto2 for the first time this year, but its original rider Hafizh Syahrin ended up moving to MotoGP with Tech3, and neither of his replacements - Zulfahmi Khairuddin and Niki Tuuli - have managed to score a point so far. For 2019, the team will field Khairul Idham Pawi, who is currently in his second year in Moto2 and is 27th in the standings. In Moto3, SIC has signed series veteran John McPhee alongside Ayumu Sasaki - who will continue with the team for a third consecutive season. Last edited by Keshav; January 28th, 2019 at 11:13 AM. Is that an old copy & paste? Yes - I knew about Nakagami. The Avintia crew - not. It was from a current piece on Autosport. I posted it because I'd not seen anything previous stating riders on the SIC team. Last edited by Keshav; January 28th, 2019 at 07:10 PM. And people get paid for posting such outdated info?! Would you feel better if they were doing it for free? No, but my point is if you are being paid to do something, you should know more than a casual fan.